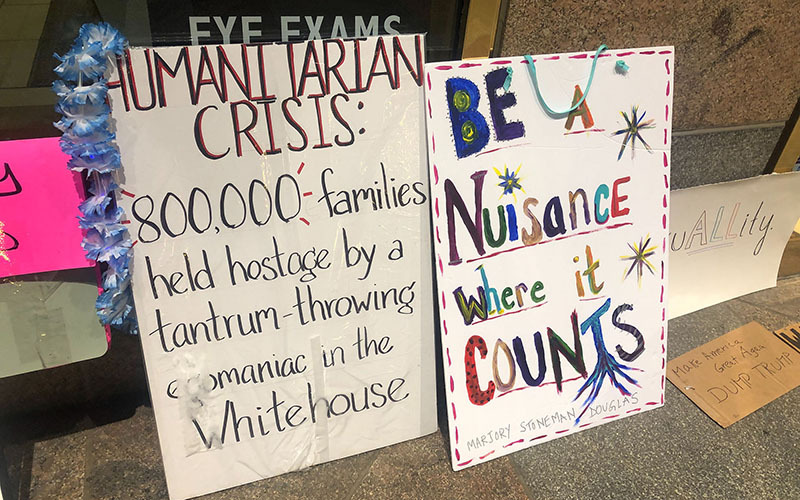 “Washington is a city where change happens, it is important that we have bodies here,” said Zoe Isaac, a Scottsdale resident who joined thousands packing Freedom Plaza, about halfway between the White House and Trump International Hotel. The day began with a short march past the hotel before returning to the plaza for hours of speeches, many aimed at President Donald Trump and his administration. 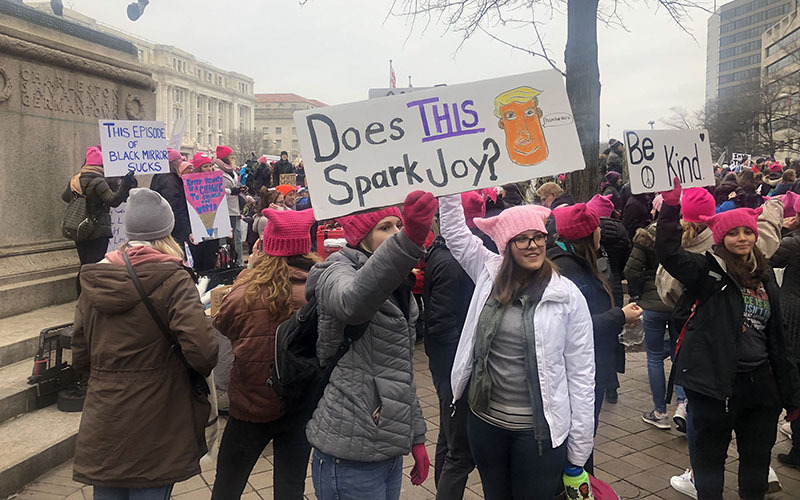 Trump was the spark for the original Women’s March, when hundreds of thousands of women descended on the National Mall one day after the president’s inauguration for a star-studded protest. Sister rallies in cities around the country and the globe boosted the number into millions, organizers said. “I hope people will become more aware of how important women are in our country and how we can speak out and change things and make the world a better place,” she said from the rally, as Aretha Franklin’s “Respect” blared over loudspeakers. Tucson resident Beth Morrison said it was important for her to make the trip because she was unable to come to the first two marches in Washington. Morrison said it was important to her that women’s voices be heard. 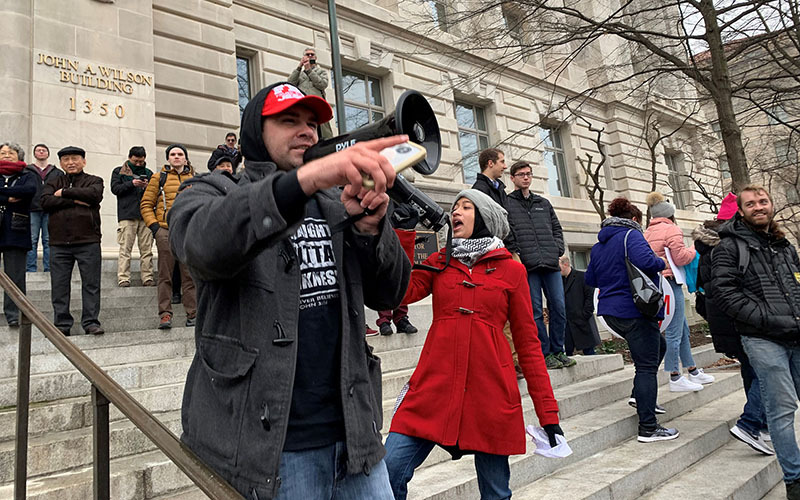 But marchers were not the only loud partisans at the event: Small groups of counter-protesters with megaphones were on hand, preaching anti-abortion messages at the event. They were mostly drowned out by people in support of the march, some with their own megaphones, who got the crowd chanting over the counter-protesters. There was also a counter-march. The March for All Women was held at the same time and just a block away from the Women’s March. 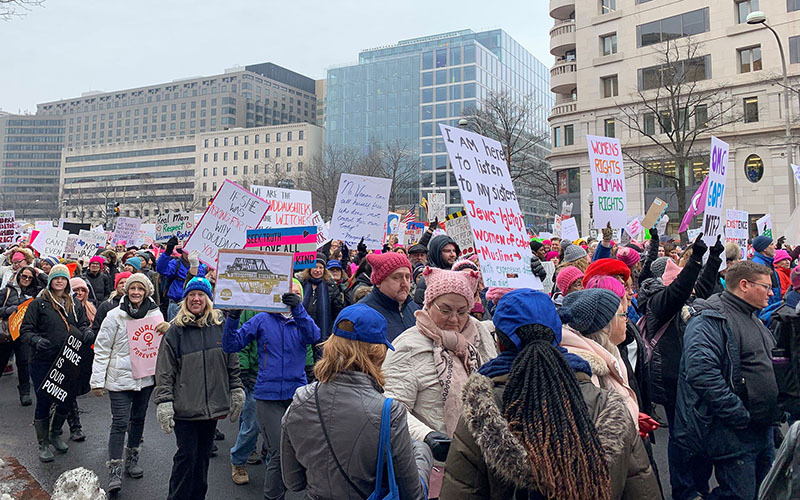 “March For All Women represents the rising tide of women who stand against the divisiveness of the so-called Women’s March movement,” said a statement from Carrie Lukas, president of Independent Women’s Forum, which organized the event. The agenda Lukas was criticizing was the “intersectional feminist policy platform” created by Women’s March organizers. The 72-page document calls for everything from a $15 minimum wage to reproductive rights from addressing violence against women and immigrant rights to ending the war in Yemen. Signs at the rally reflected a range of those viewpoints and hours of speeches – more than 40 speakers were listed by organizers – covered the same topics. As in previous years, there were “sister” marches in other cities, including several in Arizona. But Isaac said that while she had attended the previous two marches in Phoenix, being at the main event in Washington felt different. “There is a different vibe when it comes to being in D.C.,” she said. Isaac said attending this march made her think about her future. “If I have a daughter one day, what I’m going to say that I did when it came to this time in history?” she said. Ashley Rhodes, also from Scottsdale, said she was motivated by the event. “Sometimes we get cynical and everything else but when you see this many people from all over the country coming together … it’s powerful,” she said.